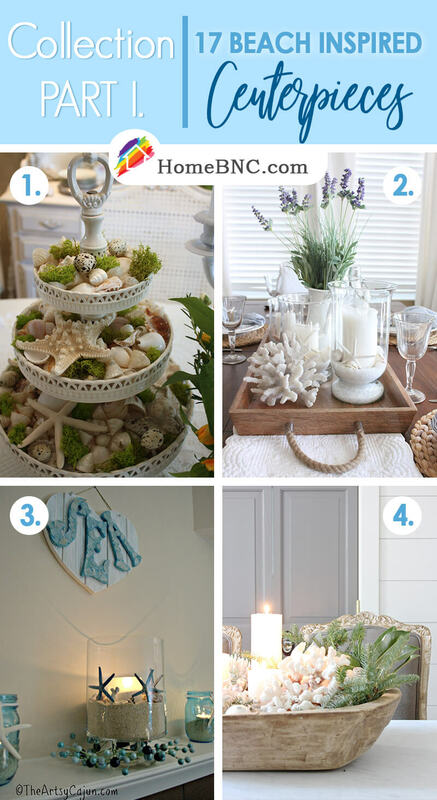 Turn any table, mantel or nightstand into a picture-perfect seaside moment with a beach themed centerpiece design. These ideas can work during any time of the year, so there’s no need to wait until summer before picking out the perfect idea. There are so many variations possible with this theme, so there’s a look for any kind of style and decor. Bright colors and warm, natural touches like sand and seashells capture that fun-in-the-sun feel. Organic materials like driftwood and fisherman’s rope add a nautical flair to any design. Candles and floral accents that would be found along the seaside, such as wispy and wiry reeds and grasses, hint at romantic and windswept vacation evenings on the coast. Pieces like these can be mixed and match with woven place mats or arranged on painted cake pedestals. 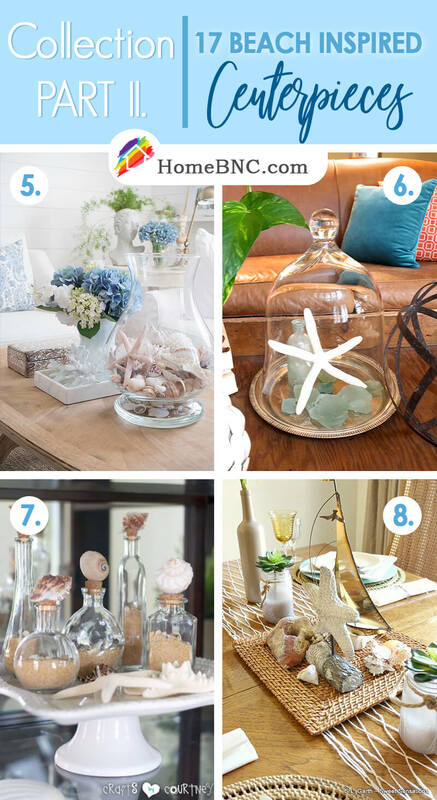 Glass fishbowls or low-sided wooden crates also help these coastal details stand out as a centerpiece. Mason jars for candles and perfume vials for sand also add elegance to any sea-inspired design. Whether you’re into a rustic sort of charm or prefer a clean, chic take on a beach-inspired theme, you’ll find plenty of inspiration here. Discover your perfect blend of coastal charm and beachside chic down below. This inventive use of a serving stand features a rich mix of textures. Soft, sea-foam moss and geometrically intricate shapes of the starfish and seashells echo the scalloped edge of the ceramic tiers. The pearly luster of the shells and porcelain glaze give this centerpiece’s rustic feel an elegant touch. A pop of color stands out beautifully when paired with an all-white and neutral palette like this. The rough texture of the coral and sandy bedding for each candle is complemented by the scattering of shells and sea stars. Displayed against a tray and table of matching walnut wood, they brighten any room. Choose this beach themed centerpiece for placement on a narrow mantel or a table in a hallway. The contrast of a clear glass candle-holder with the blue tint of mason jars comes together with matching starfish in opposite colors. A ring of berries in similar blue hues completes the fresh and romantic theme. Whether you’re decorating for a coastal winter holiday or a breezy summer brunch, a centerpiece like this makes an elegant and dramatic statement. An artful arrangement of corals, shells and scrub brush accents pairs naturally with a distressed driftwood bowl. Nestling candles of various heights inside the display can add fragrance and flair. A hurricane lantern and marble tray each hold wildly different designs, but together they make a beautiful contrast that fits. Each piece signifies a separate beachside spirit. The blue flowers and white coral mimic ocean waves while the sand-colored shells in the glass lantern leaven an impression of a sparkling shoreline. This bell jar and copper platter hold treasures from the shore as if they were fit for a museum’s display case. Instead, they make a beautiful addition to any coffee table or shelf space. When you’re making the most of a small area, add height instead of width, and use a few key statement items like an antique bottle and fossilized starfish to stand out. 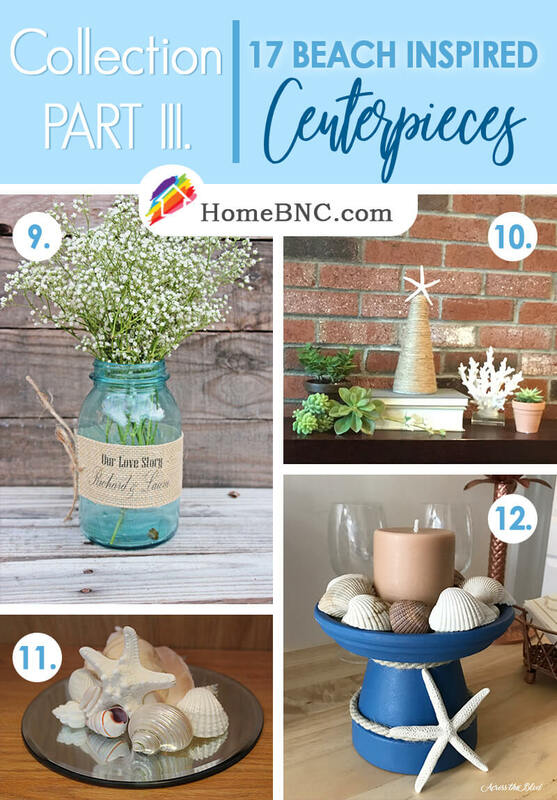 A beach themed centerpiece like this is the perfect solution for anyone who wants to display sand they’ve collected from different beach vacations. Small coquina shells in each one make every bottle look like a miniature coastline. When they’re collected together on an elegant white pedestal with a few loose nautical pieces, the look is effortless and modern. Give a table’s center a castaway feel with a bit of netting and a woven mat on top. The twin around each mason jar matches the natural textiles while the spread of sandstone rocks and seashell details adds whimsy. A sculptural element like this gold sailboat and seagull offers interesting texture and metallic sheen. Show off a sweet and inspiring message with the perfect pairing of a mason jar wrapped in burlap and twine. This simple but beautiful idea looks best with a wispy bouquet of baby’s breath, but they could also hold a candle to light up a nighttime table design. As keepsakes for guests, they serve as a charming and useful gift for any memorable occasion. Finding a beach themed centerpiece that can work with a winter holiday theme isn’t always easy, but this twine-wrapped cone starfish topper could do the trick. Dress it up with a collection of succulents and a matching piece of white coral for any time of the year. The simplicity of its design works best when arranged in tiers to show off different heights. When you need a centerpiece with a low profile but a big impact, a mirrored pedestal enhances the look of any design. This clever collection of shells and a singular starfish creates an understated but trendy look. The mixture of textures, shapes and sizes are brought together by a complementary color palette in neutral pinks and pearly whites. Simple shapes and a bold pop of color make this centerpiece work beautifully in a variety of themes. That bright Caribbean blue stands out with a few smart and effective details, like the white shipping rope and sea star fixture. A sand-colored candle and matching neutral shells lend warmth and balance to the design. Big, bold pieces like this collection of gnarled and chunky driftwood look amazing when arranged in a cleverly winding line of shapes and sizes. 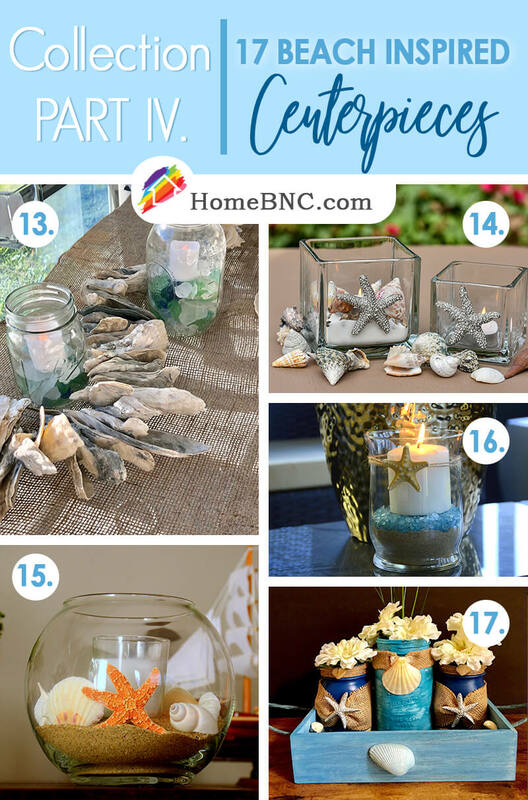 The smart placement of large mason jars filled with sea glass in various colors keeps it looking rustic and chic. The strip of burlap beneath ties it all together without any fuss. The square votive holders and metallic starfish make a bold, modern statement that’s softened by the white sand and warm candlelight within. Natural shells in a variety of earthen and ruddy tones add visual interest both in and out of glass holders. The random scattering around the edges of the centerpiece act as an organic and artful border. Fun, whimsical centerpieces like this work best when they’re kept simple and contained. The use of a fishbowl is a perfect way to set a seaside-inspired theme with a bit of character and a candle to light it up. A boldly bright starfish help the pops of color in more neutral shells stand out and the varied grains of sand look dynamic. Pairing a sand-filled bottom with a topping of clear blue glass not only gives off the impression of an oceanside view, but it also makes for a great way to display a single large candle. A bit of twine that strings around the mouth of the jar twice before disappearing behind a starfish feature completes this sweet and simple design. Variations on a family of blue hues create a matching collection of items that boast bold accents and whimsical textures. Burlap and twine details bring out the natural, rustic feel of a beach cottage getaway while the cream-colored flowers soften the overall effect. Silver-painted sea stars add a pop of shine for a trendy touch.